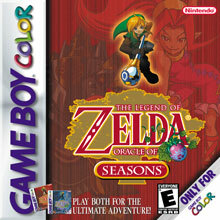 I have to admit I was pretty excited when I found out a few months ago that Nintendo was going to be offering the two Zelda Oracle releases that were originally released on the Gameboy Color through the eShop. I remember when they came out back in the ancient days when I worked at Megaplay, and never played them at the time. So being the big Zelda fan, had to purchase both as soon as they were released. I decided to give Oracle of Seasons a crack first. Even though the graphics and gameplay are extremely primitive by today’s standards, there’s just something really cool about the old school style of an older Zelda game. The whole style of gameplay was pretty amazing and something that few things can do to bring back great memories from my childhood. Playing Zelda with my brothers and friends was a pretty amazing time, and these games still stand up very well. It’s actually kinda amazing just how difficult these games still are, and I truly wonder how we were able to figure them out pre-internet. I guess I miss the whole social aspect of the playground where we would all very trade tips with one another. While this game had all the staples of a traditional Zelda game, I thought that the whole seasons approach was a pretty unique touch. The ability to have to change between seasons to unlock my puzzles was a pretty cool thing. Even though it did stump me at times. This was a pretty awesome little game, and must’ve really been impressive way back when it first came out. Will have to find some time this summer to give the Oracle of Ages a shot now.